Now this is really good fun, and one of the better thrillers at the cinema of late. 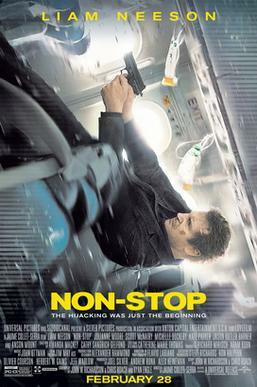 It features Liam Neeson in another post-Taken Liam Neeson role, as Bill Marks, an alcoholic federal air marshal called to action when unknown terrorists start threatening to kill people on an airplane every 20 minutes unless 150million dollars is transferred to a named account. The film is very cliched, from the cheesy concluding scenes and the standard ‘tragic backstory’ given to Marks to flesh him out, but the script overcomes this by being genuinely thrilling and keeping the audience guessing throughout. The conclusion doesn’t live up to what preceded it in terms of the terrorists motivation but to an extent this is unimportant – this film is all about the journey and it’s a blast getting there. The flight sequence towards the end is superbly exciting and whilst it isn’t quite on the technical level of the stunning sequence in last years ‘Flight‘, it’s still a cracking sequence. Another plus point is the wealth of good actors filling out the supporting roles, from Downton Abbey’s Michelle Dockery to Scoot McNairy, Corey Stoll and Julianne Moore, which increases the performance standards somewhat. If you want a good tension filled thriller to keep you guessing throughout, you can do a hell of a lot worse than checking Non-Stop out.